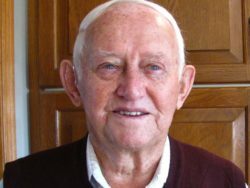 Ted Roelofsen - Heritage Funeral Homes Inc.
After a lengthly illness at Caressant Care Nursing Home, Arthur on Sunday, March 3, 2019. Ted was born 98 years ago to Jan and Jannie Roelofsen in Holland. Beloved husband of the late Alice (van Harn) Roelofsen (2013). Ted was the adoring father of Gerda (Piet) Van den Top of Holland, John (Brenda) Roelofsen of Arthur, Hennie (John) Montague of Welland, Tony (Grace) Roelofsen of Alma, Art (Jeanette) Roelofsen of Arthur, Janet (Ian) Harrop of Fergus, Ralph (Johanne) Roelofsen of Arthur, and Murray (Patty) Roelofsen of Arthur. He was the proud Opa of Monique (Arjan) de Bruijn, Ronald (Merel) Van den Top, Mark (Mariette) Van den Top, Jason Roelofsen, Jeremy (Krista) Roelofsen, Carrie Mcdonald, Jamie (Janelle)Montague, Micheal (Melissa) Montague, Andrew (Amy) Montague, Stacey (Colin) Hutchinson, Vanessa (Kevin) Roelofsen, Samantha (Brett) Roelofsen, Chris (Melissa) Roelofsen, Greg (Amanda) Roelofsen, Jennifer (Mark) Timmerman, Terry (Rachel) Boutcher, Ashley (Matthew) Wannamaker, Ryan (Jessica) Harrop, Richard (Shelley) Roelofsen, and Sarah Roelofsen. Great Opa of twenty four. Ted was the dear brother of Alie van Grootheest and Willie van Lagemaat of Holland, John (Nellie) Roelofsen of Brampton and brother-in-law to Art and Henk van Harn. He was predeceased by brothers Jan, Willem, Gerrit, Albert, Evert, and sister Jannie and brothers-in-law Gerrit, Gerritt, Everett and Rick. Ted will be fondly remembered for his hard work and his social personality that loved a good game of pool, euchre or shuffle board. The family will receive friends at the Crawford Funeral Home, 243 George St., Arthur on Thursday, March 7, 2019 from 2-4 and 7-9 pm. The funeral service will be held at the Drayton Reformed Church, 74 Wellington St. S. Drayton on Friday, March 8, 2019 at 11 am. Spring interment Greenfield Cemetery, Arthur. Remembrances to the Groves Hospital Foundation or a charity of choice would be greatly appreciated by the family.